Wipro, a leading global technology services company, continues to bring highly demanded IoT applications to public and private sector organizations. On 9 November 2015, Wipro announced a partnership with Cumulocity, a market leading Internet of Things (IoT) application enablement platform vendor. Wipro will bring a series of services to make it easier for enterprises to build and offer end-to-end IoT solutions. And Wipro will use the Cumulocity application enablement platform (AEP) to power its IoT solutions. MachNation believes this partnership between Wipro and Cumulocity is an important event in the IoT ecosystem and in the AEP marketplace, because enterprises must engage high quality IT systems integrators and AEP vendors to maximize the success of IoT deployments. Wipro and Cumulocity have complementary solutions – the former focused on a deep set of IoT services, and the latter focused on award-winning AEP technology. Together, we believe Wipro and Cumulocity offer enterprises and public sector organizations an end-to-end IoT solution of technologies and services to connect IoT devices to applications. 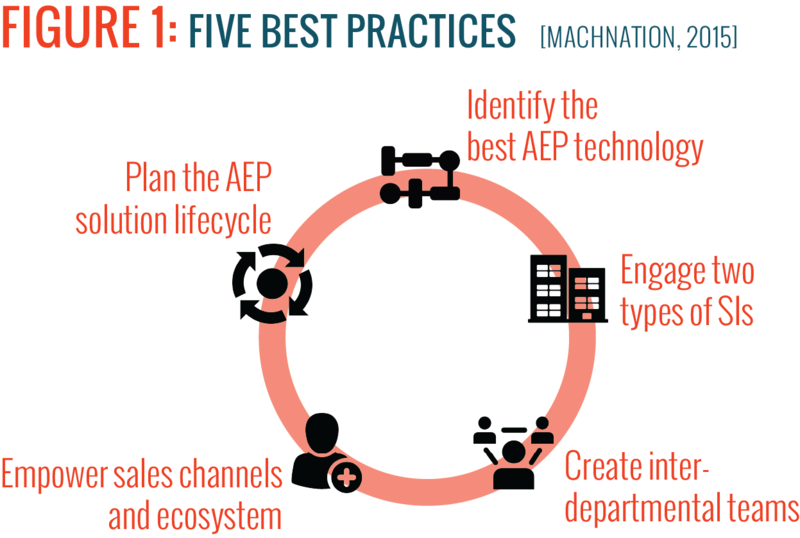 In prior research, MachNation presented 5 best practices for deploying an IoT application enablement platform (AEP). See Figure 1. We would like to focus on one of those best practices – the need to engage IT-services systems integrators (SIs) in the deployment of an AEP. We believe that the partnership between Wipro and Cumulocity provides enterprises a way to satisfy this best practice. 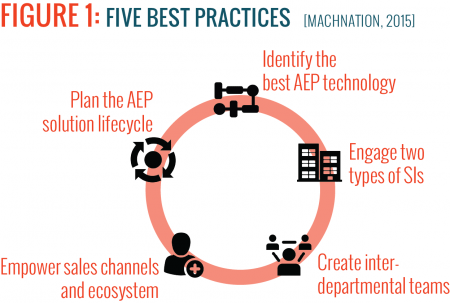 MachNation recommends that enterprises deploying IoT solutions engage an IT services SI that has two areas of expertise – device-centric and applications-centric expertise. Why? An AEP will need to be tightly integrated with components of an enterprise’s IoT technology stack. These integrations ensure that data from the AEP are stored, federated and orchestrated properly between devices, platforms and applications. IoT devices (e.g., modules, gateways, routers and IoT computers) and the AEP. Enterprises continues to make use of a wide variety of protocols and data formats for IoT deployments, therefore, it will be necessary to manually integrate new devices to platforms. In order to complete these types of integrations, IT services SIs should be very familiar with IoT communications over a variety of protocols (e.g., HTTP, CoAP and MQTT) and industry-specific and generic data formats (e.g. JSON, XML, and CSV). Enterprise applications and the AEP. The value of an IoT solution depends on the integration of IoT sensor data with visualization tools, analytics packages, enterprise applications and existing enterprise data. Enterprises often need to move IoT device data from an AEP to cloud-based and on-premises enterprise applications including inventory management, ERP, CRM/SFA, logistics/tracking tools, storage databases, analytics and business intelligence. MachNation recommends that enterprises engage IT SIs that have experience in application integrations for the types of applications requiring IoT integrations. MachNation believes that Cumulocity has partnered with Wipro, because Wipro has the recommended IT SI experience in IoT communications protocols, data formats and enterprise applications to provide enterprises with the services necessary during an IoT deployment. MachNation also believes that Cumulocity provides Wipro a critical piece of the IoT technology stack – the AEP – that facilitates the safe and efficient transfer of IoT device data to enterprise applications. MachNation, a specialist analyst firm focusing on layers 5-7 of the IoT technology stack, will continue to track significant developments in the IoT ecosystem like this relationship between Wipro and Cumulocity.